Samsung Galaxy S 4G comes with a Super AMOLED touchscreen display, Android 2.2 (FroYo) operating system, 1 GHz processor, 5 megapixel camera, 4G Connectivity, Wi-Fi, Bluetooth, microSD card slot, up to 32 GB expandable memory, 3.5 mm headphone jack, Android Market, FM Radio, A-GPS and more. The complete specs of this handset is not available yet. 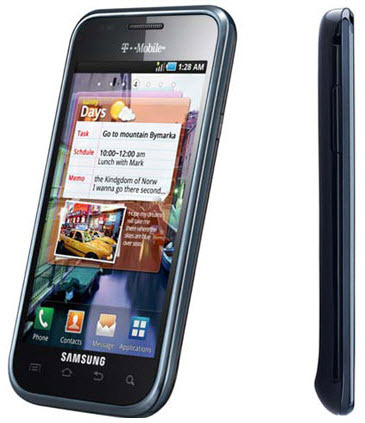 According to T-Mobile, the Galaxy S 4G will be the fastest smartphone and the company’s first smartphone capable of delivering download speeds of up to 21 Mbps. The price and release date of this device is still unknown. But, we can safely assume that the device will be priced at $199.99 with a 2 years service agreement. Stay tuned for more updates, regarding this powerful smartphone. i am using it, it is really a great thing i love it.